We can obtain everything here; it is just necessary to know WHERE and for HOW MUCH! At first, I’d like to warn you that there are 2 very different worlds. The first one is taking place in modern luxury supermalls with the latest trends from all world fashion brands and with fixed prices, even higher than the ones in Europe. The second one is “very real”, on many specific markets, we can find fruits, vegetables, fish or flowers, animals, souvenirs or antiques… and for sure “authentic fakes” from almost all fashion brands! Here, you can bargain the prices! 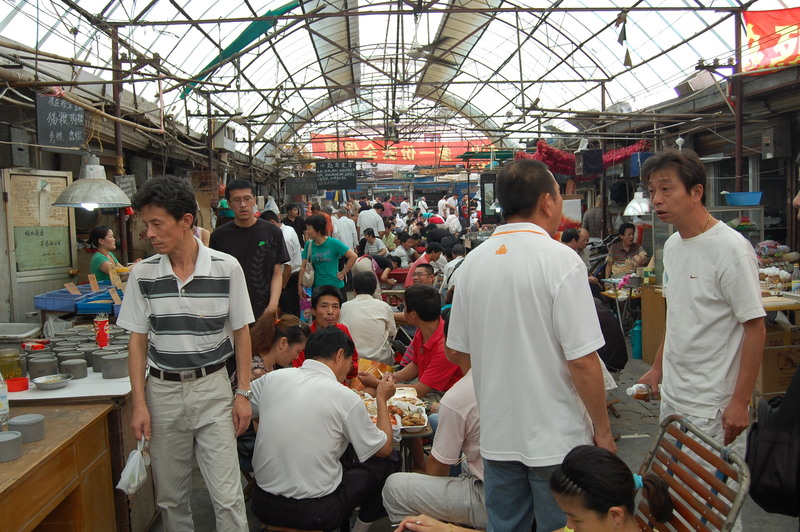 The atmosphere for foreigners is indescribably “different”. What caught my attention at first was the “antique market”, because I love antiques, mainly porcelain. 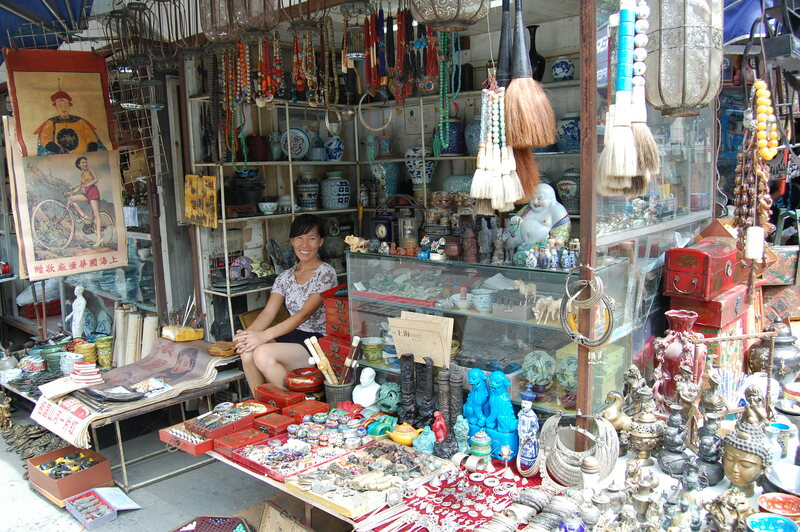 “Hello, lady!” shout the smiling shopkeepers on the market with antiques, bric-a-brac and all kinds of souvenirs (pins with Mao, fans, jade jewellery, Buddha and terracotta soldier statues…). I am strolling on a hidden street in the centre of Old Shanghai. I am a clear target for the locals! Tourists are almost the only ones who buy things here. I am walking around slowly and pretend that I don’t hear. From afar, I am watching everything that pleases me: beautiful porcelain doses, bowls, statues… I constantly nod and smile at their greetings. Then I commit a little mistake; I simply stop and admire one beautiful vase. At that moment I have a calculator in front of my head, and I have to write a price! That’s smart (from her because I honestly don’t have any clue about the value and price). “No no, I am just looking, thank you”, I am trying to move out. Yet, suddenly I find myself inside of a small, sultry shop overloaded with commodities. It’s about 30 degrees outside and it’s even hotter here. The shopkeeper sensed that my resistance progressively weakens, she is friendly and constantly proposes prices to everything I point at! After half an hour of “heavy bargaining” I am leaving satisfied with a bag of three Chinese wise men carefully wrapped in an old newspaper! From now on they have a new home but I don’t know where I will put them yet… I am satisfied and they please me a lot, which is the main thing. And yet, a completely different exotic environment ruled a few dozens of meters away, in a covered huge hall! I walked there completely by accident. Here was a very different kind of range. 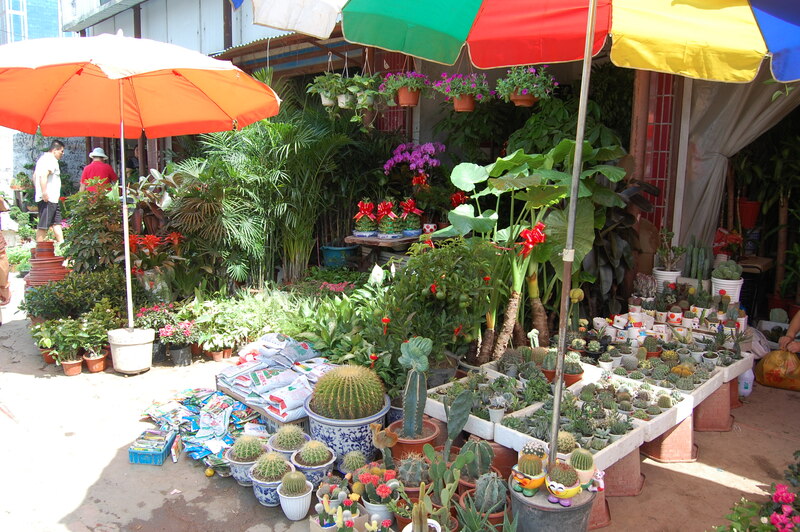 Flowers, pets, truly cute puppies, fish, birds… Here were on the other hand, only Chinese people. “But what do they have in those cans?” I observe the numerous groups that completely ignore my presence. On the ground or on a trolley are packed bigger or smaller cans or pots from jams. “That’s a cricket or something” I try to guess their content. 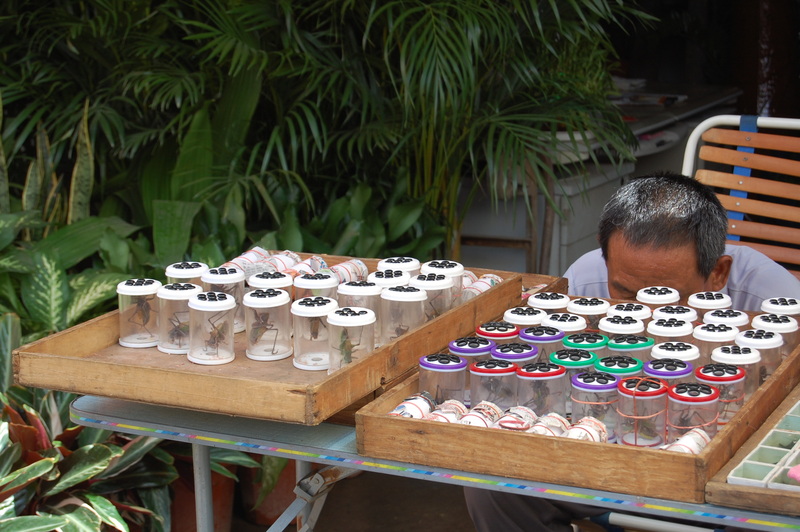 No, they really were crickets of all possible sizes and categories, ready for purchase and later put into “fights”. Bizarre. I buy myself one despite the locals’ surprise. I wouldn’t like to forget mentioning an incredibly interesting but “touristic” atmosphere in the centre near the Yu Yuan Garden. It is almost compulsory for all touristic groups to visit this place. This actually only complex in the city offers a stylish Chinese architecture with a preserved garden with classical elements (water, stone, pavilions, plants). I really enjoy a beautiful rockery from Ming dynasty but even the ancient teahouse that was built up by cotton merchants in the 18th century. It is barely the late morning and it is already crowded. 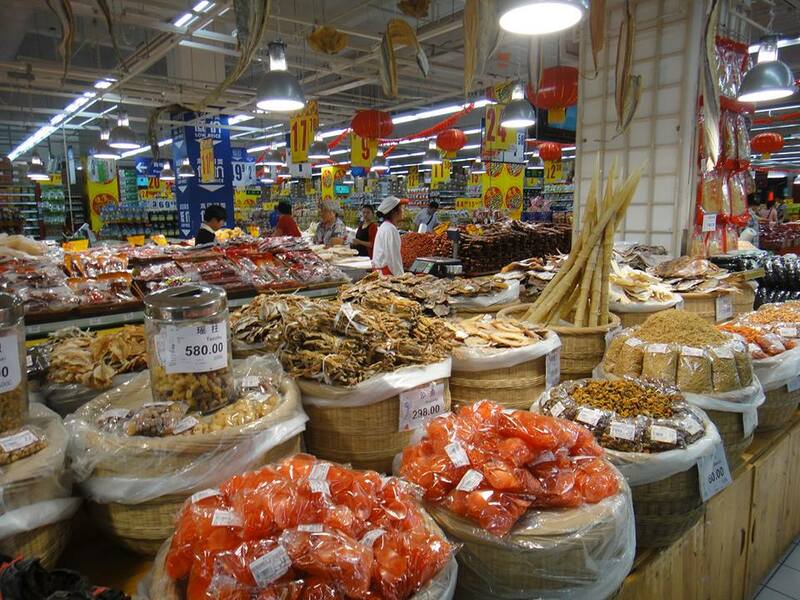 Surrounding stands offer again an inexhaustible choice of souvenirs, from silken scarves to Chinese traditional clothes. ”Watch, bag! Watch, bag!”- I constantly hear around me. So if someone was perhaps thinking that that these friendly people are warning the tourist to “watch their bags”, it would be a mistake. I only stopped once so as to examine the “offer” in the catalogue. “Hmm”. Incredible, all kinds of different fake handbags and watches from world known brands. I refuse with thanks. In case I would have shown any sign of interest, he would have brought me to a close by shop. Behind the back doors would be a “stock” of goods of various prices and quality. The salesman is clearly disappointed but the day is not finished yet. Although I don’t want anything at all, I will leave after one hour of “hard bargain” with bags all full of beautiful things… that I obviously don’t need! At least they will surely please my loved ones! PS: Perhaps I did a “business” mistake, because according to the salesman my cricket was “good quality”, i.e. it would surely win in the wrestling competitions but I gave it freedom. Be honest, it was worse…thank you and I look forward to further insights! I like it! Bye. K.
Really pleased you liked that…it was a couple years ago but I still remember all details :), great experience! Bye. Thank you for fallowing my blog today! Looking forward to read more from you! That place is overwhelming…I hate shopping…really! I should be kicked out of the girl’s club. But, I do like trinkets…memories of a different time and place. I do think I would like to take picture, though…lots of color and interesting objects.